We need to understand that representation matters, and girls of any shape, size, and personality can be successful in STEM fields. 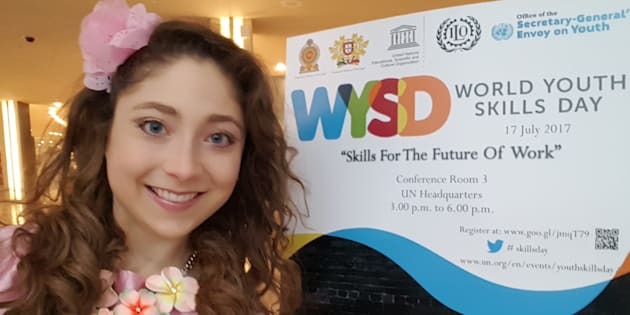 Despite being a woman founder of a tech startup with two pending software patents and having completed a thesis in herbal medicine within my first year of university, I struggle to associate myself as a woman in STEM. Inside, I share the same interests as most STEM enthusiasts. Growing up, I actively pursued math and science I asked for chemistry sets for Christmas, I made slime and rockets in my kitchen, I taught myself calculus, I participated in science and space camps - I was captivated by everything related to discovery and innovation. My experiences from a young age check all of the STEM boxes: curious; innovative; intelligent; risk-taking. So, why have I always felt like an outsider in STEM circles? The answer is because I have always been an outsider. Among 800+ students in my first year university science class, I guarantee you would be able to spot me in the crowd. Though, the reason for my noticeability may not be what you think. I did not stick out because I was a woman. While women may still be lacking in STEM fields, there were enough present to not make me feel entirely alone. The real reason I stuck out was that, while inside I am by definition a woman in STEM, on the outside I look anything but the sort. In university, I was quickly labeled: "the girl with the pink accessories and hair flowers." The message to conform to fit in is not one I support, because it sends a message to girls that it's beneficial to hide their identity to fit in. In the halls, I almost always had my sense of belonging questioned. I commonly would get asked: "Are you lost? Do you need to find the Social Sciences building?" You see, the Social Sciences building is where girls like me were supposed to be. According to stereotypes girls who like fashion are expected to be found in the arts and social departments, not in advanced calculus and organic chemistry class. The typical attire of most women in my classes were sweats, jeans and plain colours. Skirts, high heels and hair bows were certainly not the norm. Could I have chosen to subdue my look to fit in? Yes. Did I? The message to conform to fit in is not one I support, because it sends a message to girls that it's beneficial to hide their identity to fit in. As campaigns for girls in STEM continue to grow, it is equally important to consider the portrayal of girls in STEM that we are putting forth. A girl's interest in STEM has nothing to do with their personal style, interests, or personality. Contrary to popular representation, not all successful women in STEM fields are introverted, analytical types. Beautiful girls can be smart; stylish girls can be nerds; quiet girls can be leaders; and outgoing girls can be lab technicians. To fully foster a culture that respects women entering the STEM fields, we need to understand that representation matters, and girls of any shape, size, and personality can be successful. In school and at the onset of my leadership career, I was faced with a choice: I could dull down my bold personality and style to fit in like the rest, or I could be true to myself and face the inevitable challenges that would come from being different. While I was encouraged by many executive male mentors to choose the first, I went with the latter. First year university can be tough for any student. Leaving home for the first time, starting fresh without old friends or family, and beginning a new life, sometimes in a foreign city, the desire to belong is stronger than ever. The struggle for identity is even greater. Feeling like an outsider was a challenge, but dealing with the feelings that came with hiding who I was and not being true to myself was even harder. So, I made my decision. The first day of chemistry labs set the tone for the rest of my leadership career. When I walked in there were stares, smirks and laughs, and surprise, but there was no turning back. Amidst the sea of white lab coats I walked in with a pink tie-dyed coat bedazzled in rhinestones and glitter. A defining moment for me, this day marks when I found the confidence to be myself and not let the opinions of others change who I was. Despite the stares and whispers behind me, I had more confidence in this moment than I had ever had before. The pressure to change who I was faded and the stress lifted off my shoulders. My feminine tastes do not define my intelligence or leadership potential. My choice was driven by the intention that if I wanted respect from others, I must first show respect to myself - my true self. I felt like I didn't belong because I was different, but little did I know that this difference was actually my strength. I gained more respect from my peers for being confident in who I was, then trying to blend in. I made friends who liked me for me, and I forged authentic relationships. I was no longer remembered as just the girl with the pink accessories and hair flowers, but as the girl with the confidence to be different and rock a pink lab coat. As my career has evolved, my lab coat disappeared but my confidence to remain true to my identity has not faded. My feminine tastes do not define my intelligence or leadership potential. I have come to accept that it is okay to be different - not to simply stand out in a crowd, but to inspire young girls to be confident in their own skin, too. Whether you want to rock a pantsuit or stilettos, wear, act, and be who you want to be. Authenticity and confidence are essential qualities of a leader. Such qualities can only come when you stay true to your identity and understand that there is diversity in success.